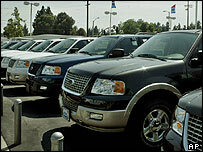 Standard & Poor's (S&P) has cut the debt ratings of US carmakers General Motors and Ford to 'junk' status. The US credit rating agency said its decision reflected tough global competition in the market and slower sales of both firms' leading vehicles. The downgrades, affecting debt worth about $290bn (£152bn), are the largest cuts to junk in a single day. A junk status rating suggests that a company is more likely to default on its debt. With both GM and Ford facing difficult times, analysts had predicted cuts to junk status later this year. But many were surprised at the speed of S&P's decision. Last month, GM reported a net loss of $1.1bn in the first three months of 2005, largely due to flagging sales and the rising cost of employee healthcare. Rival Ford also reported a 40% drop in first-quarter net profits, to $1.21bn, citing falling US sales and rising prices for raw materials. S&P cut GM and General Motors Acceptance Corp's long-term credit ratings to 'BB', the second-highest junk rating. S&P's outlook on the new rating is negative, which means another downgrade could be possible in the next 24 months. Meanwhile, S&P cut Ford and Ford Motor Credit Co's long-term credit ratings to 'BB+', the highest junk rating. The outlook on the new rating is also negative. GM and Ford, which are the world's number one and three carmakers respectively, said they were disappointed with the downgrades. Both companies stressed they had ample cash reserves.